An Ethiopian and an American discuss stewardship, an attitude and a practice taught in the Bible regarding all of one's possessions-time, money, and abilities. Does stewardship have a place in our world? If so, why? Stewardship is an attitude and practice taught in the Bible regarding all of one's possessions -- time, money, abilities. But does stewardship have a place in our world? If so, why? 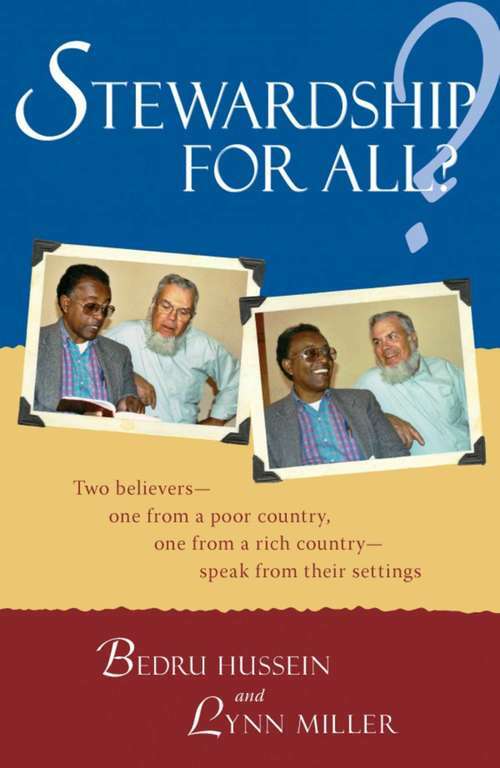 This book brings together two voices from two vastly different parts of the world to talk about the subject. Bedru Hussein is from Ethiopia; Lynn Miller from the United States. They are both Christian leaders, but their exposure to and experiences with stewardship couldn't be at greater extremes. Their cultures' standards of living, income levels, frameworks, and histories are wildly different. Naturally, their settings and circumstances affect what they think the Old and New Testaments say about this issue. This book is for those Christians who are hearing for the first time that their resources, whatever their size, do not ultimately belong to them. The book is for those Christians who have heard that theme too often, who are exhausted by hearing that they have too much. A group of stories concludes the book. They are life experiences from churches and individuals (from Belize, Indonesia, Paraguay, Ethiopia, and the U.S.) and show candidly how stewardship is practiced in these particular places today.